When asked to cite a hero, many folks are quick to extol their mothers. And rightfully so. No one else on the planet is more responsible for our existence than the woman who endured the trials of pregnancy and the labor of childbirth. Joy Fawcett was the pioneer of this special group. And you know what else is heroic? Making the U.S. women's soccer team. Training to get on the short list of the strongest, fittest, most skillful soccer players in the country is no roll in the hay. So if you put these two feats of femininity together -- making the women's national team while at the same time being a mom -- you're pretty much the master of the two-tasks-at-once universe. Six women, from national teams past and present, have given birth yet managed to hold their spots (through a maternity leave!) on the active roster of the finest soccer team America can build. These women are superhuman freaks of ambition and athleticism, and the least we can do is honor them this Mother's Day weekend. I put a call in to women's soccer legend, former national team captain and recent addition to the mom brigade, Julie Foudy. After a mention of her daughter, Isabel (who turned 16 months old May 1), Foudy launched into praise for Joy Fawcett, whose revolutionary ambition triggered one of the most incredible scenarios in all of sport -- active-roster soccer moms. "Joy was the first to give everyone the courage to do both," Foudy asserted. "In the past, all those years before Joy, players would say,'I'm going to retire because I want to have kids; I have to quit because it's time to start a family.' But Joy said, 'Wait, why do I have to retire, why don't I just keep playing and I'll pop 'em out in between World Cups and Olympics.'" Fawcett, herself one of eight children, never hesitated in hopping from the maternity ward to the pitch. "And thankfully for her and [her husband], they had great timing and fertility!" Foudy added with a chuckle. Joy and Walter have three daughters -- Katelyn (born in May 1994), Carli (born in May 1997) and Madilyn (born in June 2001). This mom of three is the only national team member in history to play every single minute of the 1995, 1999 and 2003 World Cups, as well as the 1996 and 2000 Olympics. Do the math between events and pregnancies, and you'll see the truth in Foudy's acclaim of Fawcett's timing. Foudy's praise didn't stop there. Carla Overbeck has had a lot to celebrate, both as a soccer player and as a mother. "Joy just had it together: the timing, the travel. There are so many stories about Joy and her kids on the road. She raised them with us on the road. In China, they had been sick, up all night with some parasite, and Joy hadn't slept, but you'd have never known it. She was always just so good at keeping it together. Carla, too." Foudy was referring to Carla Overbeck, the three-time All-American at North Carolina and current assistant coach at Duke, who captained the World Cup squad and the national team in her Hall of Fame career. She and husband Greg have one son (Jackson) and one daughter (Carson Elizabeth). Foudy fondly recalls Carla raising Jackson on the road -- she lived with them in Florida for a year while training for the Olympics. "I was amazed -- even before I had a child of my own, even before I knew how much went into it -- that Carla managed to be just so [pause] steady," Foudy said. "No matter how exhausted, she always made time to care for him. It would be like, 'Well yeah, we're all gonna go take a nap,' and Carla was just, 'Oh, OK, I'm gonna go take Jackson to the playground.' It's really pretty cool. Definitely inspiring to me." Tina Ellertson (formerly Tina Frimpong) is another one of the six women who have balanced a baby and soccer. Tina played for the University of Washington, nabbing the Pac-10's player of the year honors in 2003 and 2004 after giving birth to her daughter, MacKenzie, at age 18. "Being the youngest one out of all the moms, Joy and Carla were my model for how to be a soccer mom," Ellertson said. "I always just want to thank them whenever I get the chance. They really showed me that this life was possible. It's not easy! But you can do this. If you really strive to play at this level, you can do it and raise a family." In 2007, Ellertson was named to the World Cup roster. Last week, she and husband Brad welcomed their second daughter, Maya, into life. Tina told me that the best part about being a soccer mom is the strong support system her teammates constantly provide their daughters. "My daughters have 25 strong women to look up to. MacKenzie comes home with so much confidence because she has people in her life like Abby Wambach and Kristine Lilly to talk to. Our children are surrounded by confident, motivated women. That's the norm, and it makes for such a great environment." Ellertson says she is looking forward to getting back to the team someday. "This is my second time around; I'm a little nervous, but I'm also confident because I know it can be done." Here's Danielle Fotopoulos, who's about to have her third child. Although Ellertson hopes to lace them up again, legendary striker Danielle Fotopoulos retired from international play last year. Fotopoulos is the leading scorer in the history of Division I college soccer, and she was 23 years old when Tony DiCicco named her to the historic 1999 World Cup team. In November 2000, Danielle and husband George had their daughter, Alexia. In July 2004, they welcomed their son, Vasilios. Remarkably, Fotopoulos was back on the field in 2005 to chip in four more goals in five games. Danielle and George are expecting their third child any day now. On Saturday, the U.S. will play Canada at RFK Stadium in Washington, D.C. -- a match that is part of a pre-Olympic tour leading up to the Beijing Games. On the roster will be defenders Kate Markgraf and Christie Rampone. Each of these women has played in three World Cups (1999, 2003 and 2007), and both are two-time Olympians (2000, 2004) vying for their shot at a third go-round. They are also proud moms. Kate Markgraf (formerly Kate Sobrero) was a four-year starter at Notre Dame who helped the Irish win the 1995 NCAA title. The now-seasoned vet was a key cog in the 1999 World Cup and 2000 Olympics. In 2003, Kate married her husband, Chris, and in July 2006, they welcomed little Keegan Markgraf to the world. Ten weeks after giving birth to her son, Markgraf made her return to the women's national team roster. On Oct. 1 -- only three months after giving birth -- she played her first match since motherhood against Chinese Taipei. 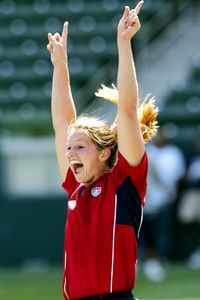 Christie Rampone (formerly Christie Pearce) came to the national team via Monmouth University in New Jersey. Upon arrival at training camp, she was moved from her forward position to the defensive line -- which was left scant, coincidentally, by the maternity leaves of Fawcett and Overbeck. The rest was history. She ended up starting in the backfield for 16 games in 1997, finishing third on the team in minutes played. And she solidified her place on the roster the next few years, appearing in the memorable 1999 World Cup and starting all five games of the 2000 Olympics in Australia. In 2001, "Pearcie" became Mrs. Christie Rampone with her marriage to husband Chris that fall. Now fast-forward to 2005, when the couple welcomed their first child, daughter Rylie, to the world. Only 111 days after a C-section delivery, Rampone returned to the lineup for the Four Nations Cup in China. In this video, courtesy of U.S. Soccer All-Access, Rampone talks about the "aunts" who keep her going and are always looking out for her little bundle of joy. "If I didn't have my teammates there's no way I'd be able to do this," Rampone said. And that highlights the coolest thing about the nursery that is the U.S. women's soccer team. You have world-class athletes leaning on each other, taking care of each other's children, all while dominating international competition. Where else can you see Wambach -- the most prolific scoring threat in the world -- "baby stealing," that is, walking into a teammate's hotel room and grabbing a baby to play with? Foudy offered this final summation: "These women deserve any recognition that comes their way. I've always been fascinated with the story of their return to the game after having kids. They are amazing athletes and just amazing women. I can definitely appreciate this incredible thing that they've done, now that I've got one of my own. You just can't understand all that goes into it until you're a mom. What they're doing is remarkable."